Posted on March 23, 2011, 10:22 am, by admin, under Recent News. The March issue of Construction Canada ran a feature about composting toilets written by Clivus Multrum’s own Don Mills and Amy Galvin. 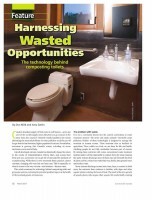 “Harnessing Wasted Opportunities: the technology behind composting toilets” covers the history of human sanitation, the troubles of the current prevailing technologies and the advantages and technology of composting systems. There are also a few quick case studies. Posted on November 4, 2010, 1:22 pm, by admin, under Recent News. It looks like lots of folks are interested in water issues lately. Yesterday three articles concerning water issues crossed our screens that were worth sharing. Is Your City Running Out of Water? : Good points us to an article on The 10 U.S. cities with the worst water concerns. U.S. Water System Crumbling, Survey Supports Fix: TreeHugger tell us that U.S. water infrastructure is old and in disrepair. This results in pollution and wasted water. Sounds to us like incentive for using composting toilets and greywater systems. Rethinking the Home Water System: Treehugger adapts an chapter from Lester Brown’s Plan B 4.0: Mobilizing to Save Civilization where the use of water to handle sewage is questioned and composting toilets are considered as an alternative. Posted on May 13, 2010, 2:45 pm, by admin, under Clivus Events, Presentations. Hear our Sales Director, Don Mills, speak in Las Vegas. His presentation, “Up S**t Creek: How We Got Hooked on Sewage and How We Can Break the Habit” will be Thursday at 2:00.